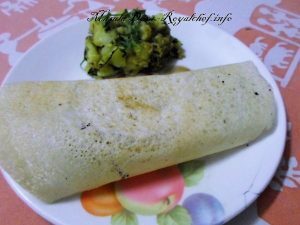 This is an easy to implement step-by-step Recipe for making at home typical Udupi Restaurant Style tasty and delicious Masala Dosa with Batata Bhaji using fresh and hygienic Homemade Dosa Batter. This world famous South Indian Snack is quite easy to prepare once you understand the basic procedure by following this simple to understand recipe. Wash and soak the Rice, Dal and Methi separately in Water for 7-8 hours. Then grind them together to make a fine paste and add the two tablespoon Suji and mix it well. After mixing the batter keep it aside for 7-8 hours for fermentation. Before preparing the Dosa add the Salt and mix it well. 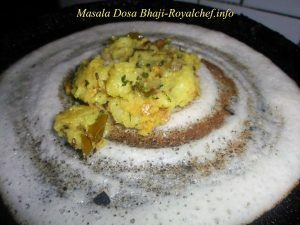 The Dosa Batter should not very thick or Watery, it should be of a dropping consistency. Soak the Gram Dal into the Water for 2-3 hours. Boil the Potatoes and peal and mash them with the help of your fingers. And add the Salt, Lemon Juice and mix it well. Half boil the Onion and then cut it into medium size pieces. Heat the Oil in a Kadai and add the Mustard Seeds, Cumin Seeds, Asafoetida, soaked Gram Dal, Curry Leaves, chopped Onion and saute for 2-3 minutes on a slow flame. Add the chopped Green Chilies, Garlic, Ginger, Turmeric and saute for a minute. And then add the boiled Potatoes and mix it well. 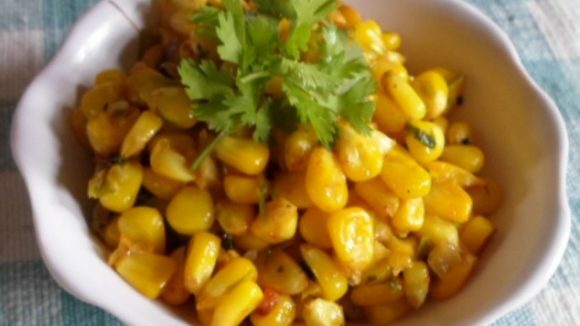 In a cup add the Besan and ¼ cup Water mix it well and add it to the Potato Bhaji and mix it well and cook for 5-8 minutes on a slow flame. Heat the non stick Tawa and apply a teaspoon of Oil over the Tawa and pour ¾ cup of Dosa Batter over the Tawa and spread it evenly and then keep the Potato Bhaji over the Dosa and fold the Dosa from both sides. Serve the Masala Dosa with Sambar and Chutney.